Many people have asked me, "Why did I bring out another anti-corrosion lubricant when I had the best product of this type INOX, already on the market". The answer is quite simple, sure INOX will cover most of the applications most of the times where an anti-corrosion lubricant is required, but there are times when a heavier, longer lasting anti-corrosion lubricant is needed to do the job. 4 years reseach and testing went into LANOX before I brought it out on the market. LANOX and INOX about 70% of the time can be used in the same application, INOX being more suitable for the lighter applications such as for electrical, hobbies and the food processing industry (type 'A' food grade approved, AQIS) and LANOX suitable for the more extreme climatic and high humidity conditions. We have found that INOX may affect some of the more modern natural rubber products with long continual use, LANOX doesn't have this affect. I have set out in the following applications where LANOX & INOX are best suited. These are the most common applications of use for each product. CONCRETE: Keeps shovel, trowels, floats & formwork clean & corrosion free between use - Stops mortar & concrete adhering to aluminium frames, window & door glass on construction work sites. CONSTRUCTION & FABRICATION: Protects bare metal & welded joints from corrosion in the open air before painting during construction. EARTH MOVING MACHINERY: Use as an anti-seize on all track & blade nut & bolts before screwing together - Penetrates to free up bolts, nuts & parts. Protects all bare metal surfaces & blades between use. FARM MACHINERY: Protects all painted & bare metal surfaces from corrosion - Protects & lubricates sprockets, chains & cables from corrosion on all harvesters(grain, cane, grape, etc. ), sowers, vegetable diggers & washers in use & in the off season. JET SKIS & OUTBOARDS: Protects outboards, clamps, props & jet skis from salt water corrosion, will not harden or harm rubber fittings - Keeps control & steering cables & linkages in good working order, lubricated & corrosion free. LIVESTOCK TRANSPORT: Spray on all livestock grates & gates (road, rail, etc.) to protect against rust & chemical corrosion before transit or in storage - Lubricates & protects locks & hinges. MINING: Protects all bare metal surfaces, pump motors (above & below ground), drag lines, winches & associated electricals from moisture & corrosion in high humidity & adverse weather conditions. MOORING & SLIPS: Stops electrolysis - Keeps winches, cables, slip cradles & wheel bushes lubricated & corrosion free Protection for electricals from moisture & salt air corrosion. PROTECTION: Protection for painted & bare metal surfaces in the open under adverse conditions from moisture & corrosion. Protects all bare & untreated timber from water & dry rot - It may darken slightly bare or untreated timber, but it will not harm it. TRAILERS: Boat, Box, Car & Horsefloats, spray on chassis, springs, axles, hinges,couplings winches, cables, light fittings & electricals for protection from salt air corrosion & moisture. THREAD ANTI-SEIZE: Spray on all metal threads before joining, stops threads corroding together makes it easier to undo the joint, nut or bolt later. For example LANOX is more suitable in certain marine applications such as Anchors, Chains & Shackle Bolts and in the protection of Outboard & Inboard Motors. INOX would be best used in areas such as Marine Radios, Sail Tracks (non-staining) and the protection of stainless & aluminium fittings ( good for polishing stainless steel, aluminium & fibreglass). For use in Firearms, LANOX is best used for long term storages purposes whereas INOX has better applications for the day to day cleaning and lubrication (anti-static) so it doesn't attract dirt and helps clean barrel residues easier. Because of it's Lanolin base it has good long term applications in areas such as cutter bars on headers, lawnmowers, linkages, etc to protect against rust and corrosion (spray onto moving parts to give protection during stand down periods). 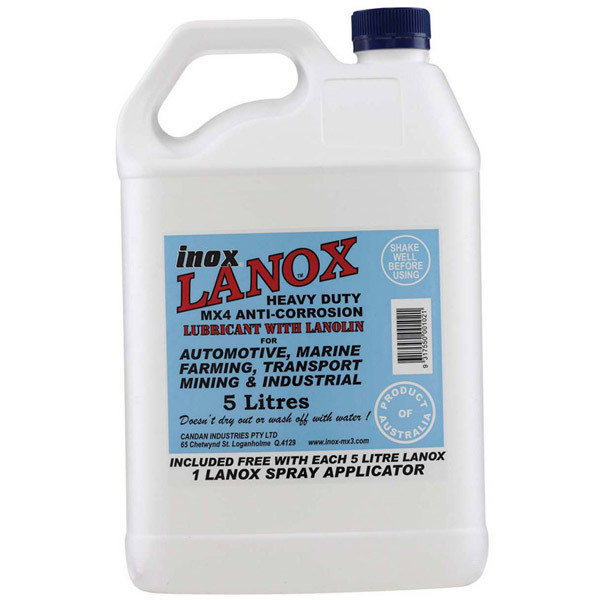 LANOX is a good anti-corrosion agent for bare metals in storage, stock crates or as a protectant after welding. 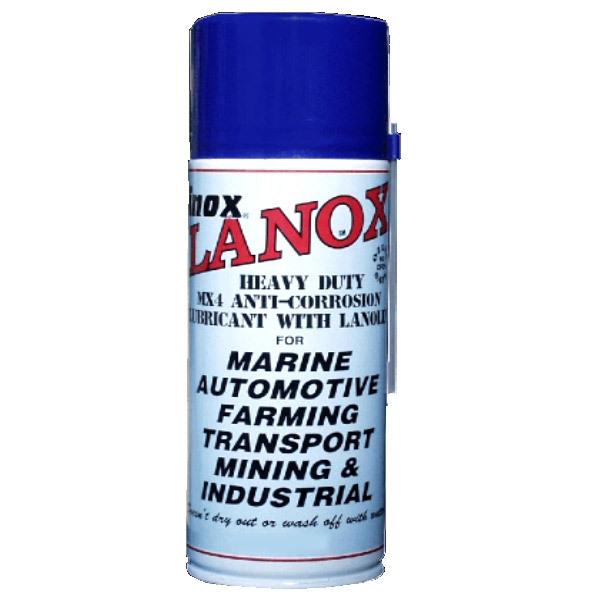 LANOX is also a good long term lubricant for areas that traditionally receive little maintenance attention (ie. gate hinges, stationary motors, etc). Yes, tests conducted prior to it's release found that LANOX is an effective cutting, milling, tapping and thread cutting lubricant for a variety of metals. It is especially effective on aluminium.